The Munsell Color Coding Chart. To ensure safety and compliance with electrical standards, Munsell worked with the Electrical Industries Association (EIA) to develop color standards that correlate to the color coding systems for electrical wire and cable, and telecom and fiber optics industries. Whether you manufacture or specify electrical wires, Munsell wiring color standards help you to ensure lot-to-lot color consistency. Color coding systems were developed to easily and safely identify wires and cables. However, given the variability of manufacturing processes, a visual color standard was required to ensure that the basic color codes were manufactured within a reasonable visual color tolerance of the exact color. 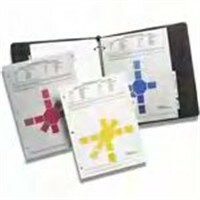 Ten (10), 8-1/2”x 11” color code charts in a binder for the following wire colors: red, orange, brown, yellow, green, blue, violet (purple), white, gray (slate) and black. Single color code charts, one each for aqua and rose wire color codes. Supplemental Munsell Color Coding Charts for Telecom Cable and Fiber Optics (EIA –TIA 598-A) Including single color code charts, one each for aqua and rose wire color codes. In each dimension, Munsell colors are as close to perceptually uniform as he could make them, which makes the resulting shape quite irregular.